Full-featured standalone mic for streamers, content creators, and gamers. 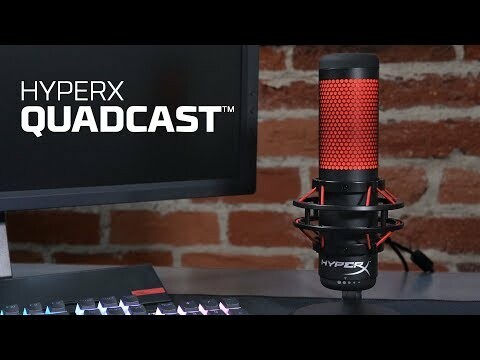 The HyperX QuadCast™ is the ideal all-inclusive standalone microphone for the aspiring streamer or podcaster looking for a condenser mic with quality sound. QuadCast comes with its own anti-vibration shock mount to help reduce the rumbles of daily life and a built-in pop filter to muffle pesky percussive sounds. Instantly know your mic status with the LED indicator, and simply tap-to-mute to avoid awkward broadcasting accidents. Select between the four polar patterns (stereo, omnidirectional, cardioid, bidirectional) and use the conveniently-located gain control dial to quickly adjust your mic input sensitivity. The included mount adapter that fits both 3/8” and 5/8” thread sizes and is compatible with most stands. Monitor your mic input with the built-in headphone jack, and QuadCast is certified by Discord and TeamSpeak™ so you can ensure that your microphone is broadcasting loud and clear for all your followers and listeners. Whether you’re plugging into a PC, PS4™, or Mac® you’ll be able to deliver quality sound to anyone tuning in. Features • Anti-Vibration shock mount. • Tap-to-Mute sensor with LED indicator. • Four selectable polar patterns. • Convenient gain control adjustment. • Multi-device and chat program compatibility. • Element: Electret condenser microphone. • Condenser type: Three 14mm condensers. • Polar patterns: Stereo, Omnidirectional, Cardioid, Bidirectional.